About the performer: Feihuo Du is the director of the 3rd generation in Natutal School (Zi Ran Men). and 1st grade national wushu judge. Man has 12 meridians and collaterals, and 8 extra channels, all of which are closely related to the five internal organs inside human body. Hence, those who purse this exercise have to be acquainted with those meridians, acupoints, the principle of universe and the alternation between the Yin and Yang by paying attention to walking, running, sitting, lying, and standing, etc. Constant effort will help build up your body and overcome your foe. 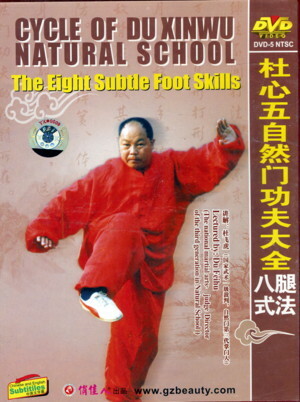 The foot skills of natural school are divided into outer 8 tricks and inner 8 tricks. The latter is also called the 8 subtle foot skills. Indicatively, it means hidden and subtle. Its 8 tricks are seldom exposed to outsiders. What features these tricks is that the hand goes with the foot, look one way and row another, each movement is elusive and overwhelming. 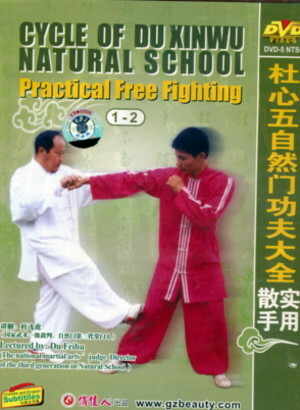 Foot skills are important in the free fighting of Natural School. There is a saying: Hands are two doors, while the foot hits. In fighting, the fist is less powerful than the foot. These show the importance of the foot skills. The foot skills should go with the footwork and take the foe by surprise. It claims to be an effective close fighting technique. 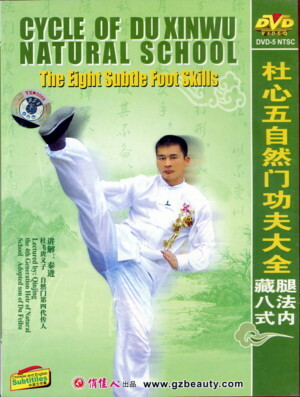 Disc 1 covers Flick (kick the crotch), Stamp (changxin leg), Hook (lift in half way), and Stride over (big side moon); Disc 2 covers Shove, Sweep, Sway, and Brush. 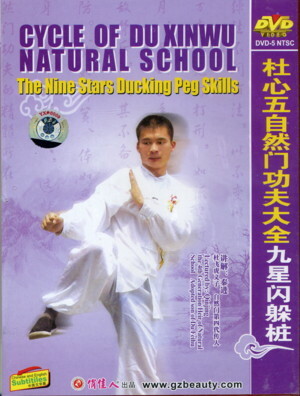 Catching skills in Natural School have recipes for subduing the opponent. That is, take advantage of an opportunity to duck and flank the enemy, twine and catch his arm, pull the wrist, twist the arm, cut the elbow, step forwards and push the opponent down by harnessing the power. Disc 1 covers (1) Xianglong elbow, (2) Grab the swrod with bare hand, (3) Catch skillfully and split the sword, (4) Grab the sword by turning over the hand, (5) The hand skill of catching the opponent; Disc 2 covers (1) Subdue the opponent by grasping the hairs, (2) Dissolve by hanging the shoulder, (3) A goat twisting the head, (4) Hug the back of waist, (5) Step on teh 7 stars reversely, (6) Hug the front waist. The throwing skills in the Natural School are different from that of the others. It emphasizes the way of practicing instead of fighting skills, dealing with various changes with calmness. It fights according to the situations, like a shooting star chasing the moon. When fighting against the opponent, strike where the enemy to defend effectively. The body is like a spring, conducting an electrical charge, and being all eyes, this is the very essence of natural school. This program divided into 3 sections: (1) Throwing by jostling the leg, thowing by holding the neck, (2) The big shouldering, thowing by goring, (3) Throwing by pushing, throwing by hugging the leg. The actual combat fighting is the same with other free fighting. It emphasizes the solid of Dantian. It looks valiant but not aggressive. It is natural. It has the hardness of Shaolin, and also the softness of Wudang. It beats cleverly by combining the void and the solid. It is elusive and undiscernible. Actually, it is a practical martial art which integrates hardness with softness. Part 2 covers: (1) Throw with strong force, (2) Hold the waist to throw reversely, (3) Chop the head with fist, (4) Lock it with the converse joint, (5) Small Twining silk. 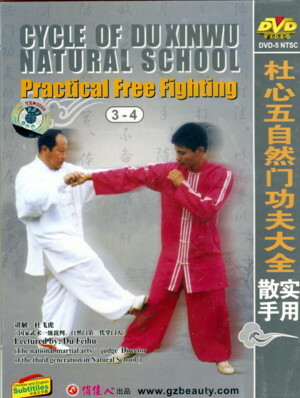 NOW US$37.50 Free fighting of Natural School is the same as its name implies. It is natural, no acttachment on routines or forms, and more to absolute quiescence or alert movement. Move like the sea waves and chop like ferocious devil. Spirit guides the fist, movement comes out of naught, seek stability from movement, move to attack, pay attention to how to defeat instead of how to show off. Success will come when conditions are ripe. Part 2 Disc 2 covers: (1) Three point stance, (2) Four successive stances, (3) Hasty stance, (4) Hold stance, (5) Turn-ring stance. When practicing his exercise, one lays nine pegs in accordance with the sequence of the Jiu-gong (9 square) diagram. Exercises around each peg, before, behind, left and right, 9 pegs in all, mount to 36, then do it reversely. This exercise integrates the movement of body, fighting and skills. Once one masters it, one can deal with a couple of foes in a walk. Moreover, he can retreat securely even if he is not the match. What features this exercise is that one can retreat as he fights, walk and duck to the flank or back of the foe. People who learn Taijiquan usually call Zhang Sanfeng as the founder of Taijiquan. 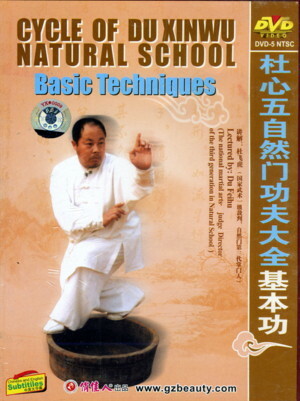 What is Zhang Sanfeng Original Taijiquan? Few people can tell it. Fortunately, the martial arts of the natural school passed on by the seniors serve as the living fossil, showing those taiji masters what the orthodox Zhang Sanfeng Original Taijiquan was. Spear sticks and wand sweeps. 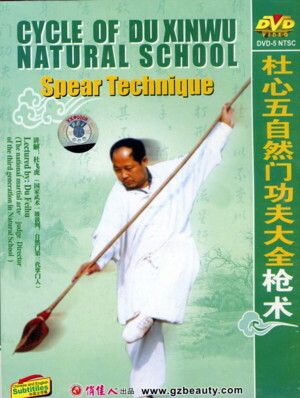 The spear technique of natural school is credited to be the king of weapons. It sticks like a snake putting out its tongue. It whirls like the bollowy waves, it haunts like a boomerang and it presses like a huge mountain. constant practice will build up one's physical strength and enable one's spear to penetrate. this program divided into 4 sections: (1) Introduction to spear, (2) Demonstration of whole routine, (3) Explanations of spear movements, (4) Follow .